This well-received exhibition was invited to be UCSC's first online exhibition. 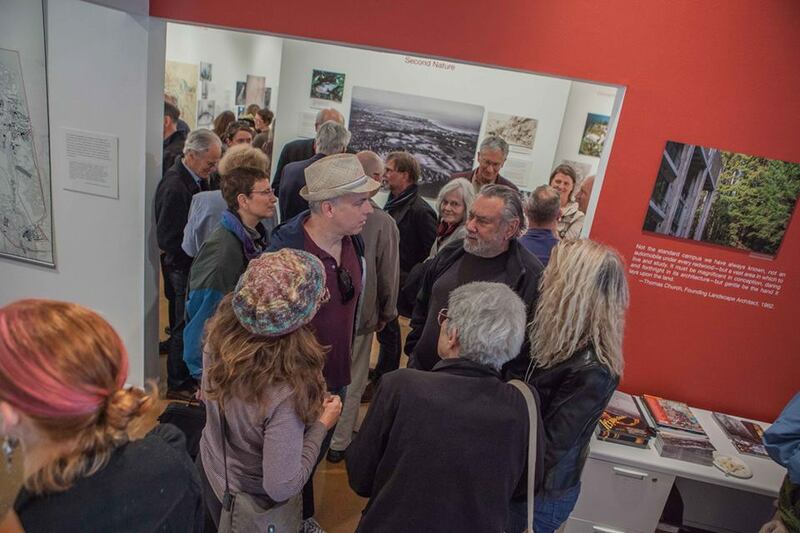 Curated by emeriti professors James Clifford, Michael Cowan, Virginia Jansen, and emeritus campus architect Frank Zwart for the 50th Anniversary of UCSC with exhibition design by Shelby Graham. Everyone agrees that the UC Santa Cruz campus is breathtaking. How was it created? An Uncommon Place traces decisive moments in the site’s early development. Here an innovative educational project engaged with a beautiful and challenging environment. 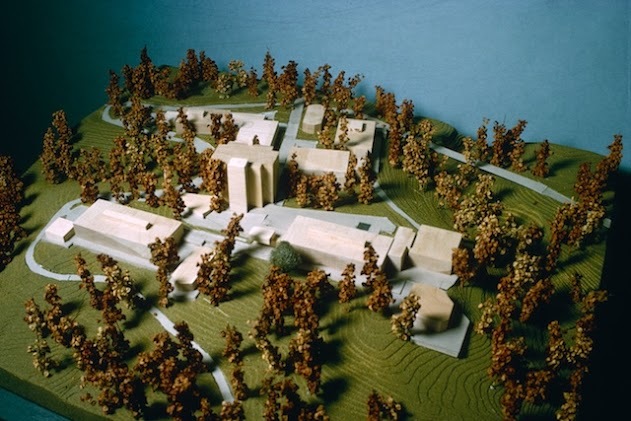 The university took shape among steep ravines and dramatic trees in a way that respected as it transformed the landscape. Using architectural plans, photographs, and oral histories, the exhibition illustrates paths taken and not taken–decisions, constraints, and hopes. 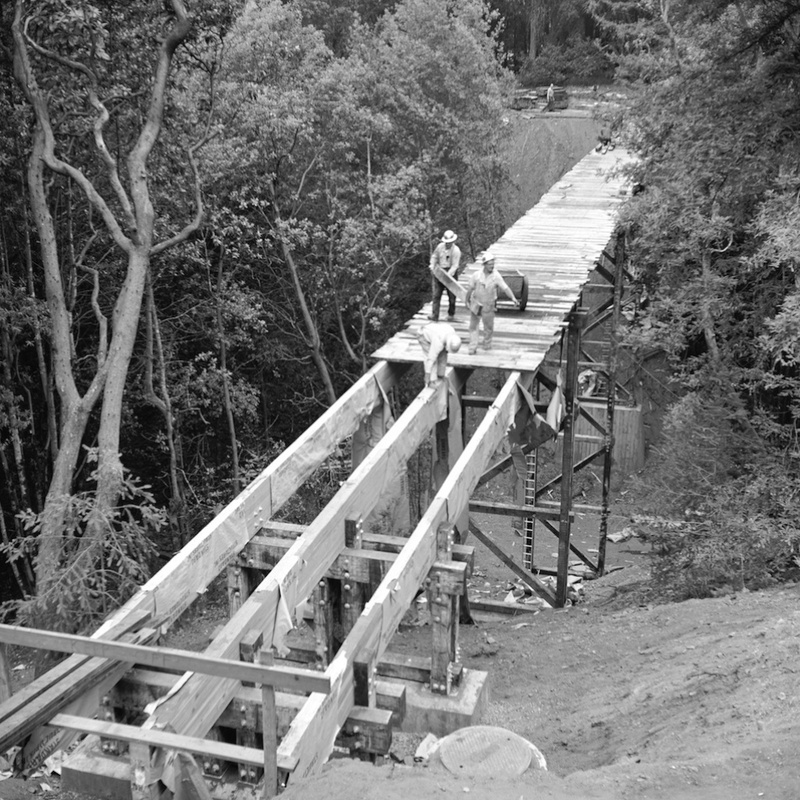 It celebrates the achievement of UCSC’s founding planners while analyzing the tensions and contradictions that were built into their project. The UC Santa Cruz campus remains an extraordinary work of environmental art. The story begins in the 1950s with a sustained postwar economic boom and the dramatic growth of the University of California. It breaks off in the late 1970s, a time of recession and shrinking enrollments, leading to a construction pause. After sketching the site’s early history, the exhibition recounts the political, economic, and aesthetic decision to locate the new campus on the Cowell Ranch property. Key visionaries are introduced, along with their crucial choice not to build in the open meadows but rather among the redwoods and ravines. 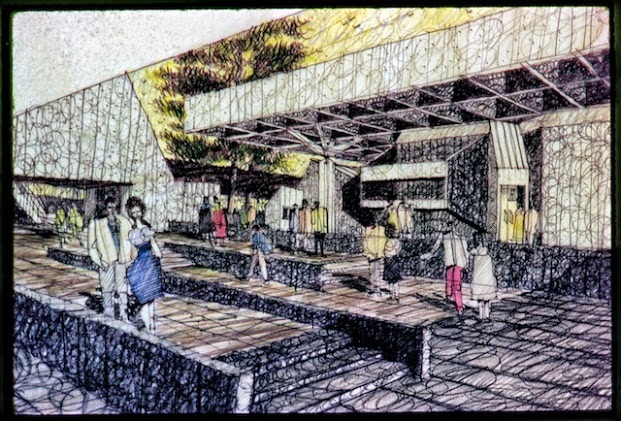 The exhibition then traces other formative decisions: the mapping of a formally structured “academic core” with informal colleges on the periphery; plans for the residential colleges; intensive clustering of scientific research facilities; and the eventual bifurcation of the campus on east-west lines. These structural features were firmly established by the end of the first intense phase of growth. Remembering these formative years can perhaps help us renew a powerful utopian experiment. At UC Santa Cruz, architecture and environment still conspire to create an uncommon place, a setting for teaching, research and imagination outside the bounds of the ordinary. 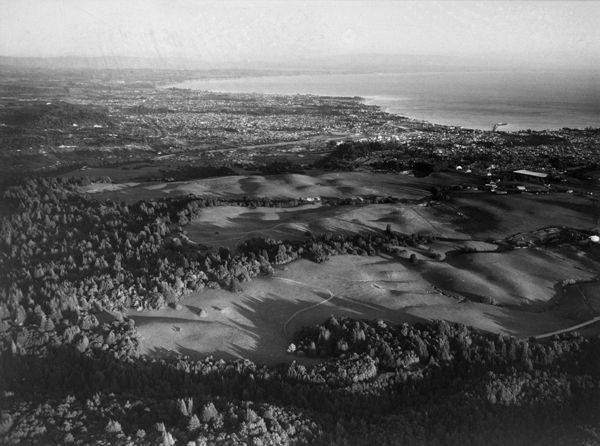 Since 2011, Professors Emeriti James Clifford, Michael Cowan, Virginia Jansen and Campus Architect Emeritus Frank Zwart (Cowell ’71) have been investigating the early history of UC Santa Cruz as a built environment, from four distinct perspectives. Neither a natural history, an institutional history, nor a purely architectural history, their project focuses on place making, and on architecture as a broadly interactive process. James Clifford, Emeritus Professor in the History of Consciousness Department, has been photographing the campus intensively for a decade and gathering an archive of images—from before the founding to the present—that document and attempt to capture the spirit of the place. He is also developing an analysis of UC Santa Cruz’s “poetics of space,” its continuing role as a utopian, visionary site. Michael Cowan, Emeritus Professor of American Studies, has had a long-standing interest in campus physical and academic planning and in the relationship of places as imagined and places as actually experienced. For a number of years he taught a course in urban planning literature that used the UC Santa Cruz campus as a case study, and he has written several essays on the campus's history. He has served on the Campus Planning Committee and on several campus building committees. Virginia Jansen, Emerita Professor of the History of Art & Visual Culture, taught courses on The History of the UCSC Campus Plan and American Campus Planning and served on the Campus Physical Planning Committee and the Design Advisory Board. She is particularly interested in the development of campus planning from medieval monastic and collegiate traditions, including the history of collegiate experiments. She continues to study the intersection of building and society. Frank Zwart, FAIA, FAUA, Campus Architect Emeritus, first arrived at UC Santa Cruz in 1967 and graduated from Cowell College in 1971. After receiving a master’s degree in architecture from Princeton University, he joined the campus’s staff in 1985 and served as campus architect from 1988 to 2010. He is particularly interested in the ways that UC Santa Cruz’s development relates to contemporaneous trends in architecture, landscape architecture, and planning. For more information contact Frank Zwart, Campus Architect Emeritus.